Is it possible to know? YES! - you can be sure - you can PROVE - which day of the week today is the same seventh day God rested on, blessed, and set apart at Creation! Here is the PLAIN TRUTH - seven separate proofs - each conclusive and irrefutable. YES, you can be SURE! GRANTED, the Bible says the SEVENTH day is the SABBATH OF THE LORD THY GOD. Granted, that God did, at creation, make the seventh day HOLY TIME, and that He has commanded us to KEEP it holy. The Questions; But how can we know, today, WHICH day is the true seventh day God blessed and made holy AT CREATION? 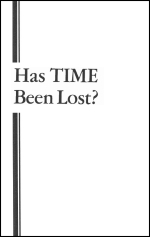 Has time been lost? Has the calendar been CHANGED? Were not ten days dropped out of it at one time?